hennemusic is pleased to deliver Linkin Park’s tribute concert honoring their late bandmate, Chester Bennington, live from the Hollywood Bowl. 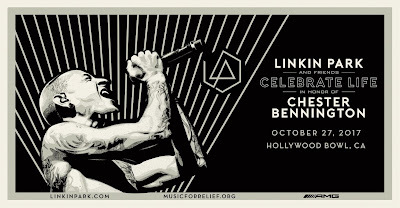 The event sees appearances by Avenged Sevenfold, Bring Me The Horizon, Blink-182, Korn, Machine Gun Kelly and System Of A Down, among others. Bennington committed suicide at his Los Angeles area home on July 20 the age of 41. Linkin Park released their seventh album, “One More Light”, in May; the project debuted at No. 1 on the US Billboard 200. The feat saw Linkin Park join a small list of rock bands that have delivered at least six US No. 1 albums, including The Beatles (with 19), The Rolling Stones (nine), Led Zeppelin and U2 (both with seven), and Bon Jovi, Dave Matthews Band, Eagles and Metallica – all with six each.